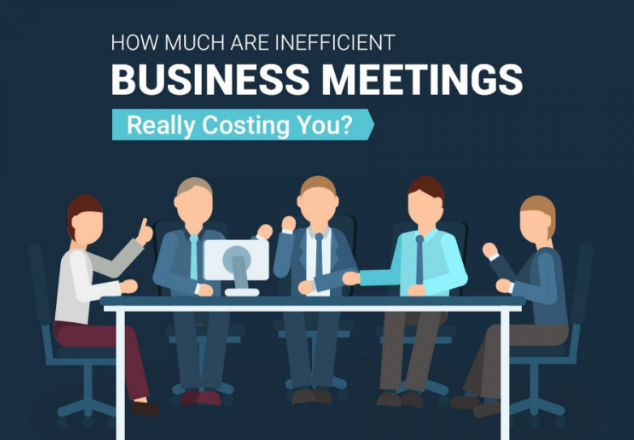 Infographic: How Much Are Inefficient Business Meetings Really Costing You? More than half of a middle manager’s day is spent in meetings and $37 billion dollars is the very high figure for revenue lost annually due to the time being spent in unproductive meetings. In fact, in the United States alone, 25 million meetings take place every single day. Quick note: the Lucid team's research suggests that the real number is even higher than this! See our numbers here. Regardless of the specific numbers you choose, we agree that there are a LOT of meetings out there that can benefit from these tips. This figure is now double the volume of meetings that were taking place back in 1999. Why the large volume of unproductive meetings? It may be due to the lack of planning skills on the part of the organizer and the ability to manage timekeeping once the meeting begins. The reality is that an effective business meeting should only include those who are absolutely necessary to be included and should go on for no longer than the allocated time. An agenda should always be prepared and the main goal for any effective meeting is to stick to the agenda and not divert from it. When it comes to meeting innovations, the world now looks to Scandinavia to lead when it comes to the development of meeting venue concepts, technology and meeting room design. Outside of this, virtual meetings have taken hold and have shown strong promise in advancing the industry at large with 75% of high-growth businesses using video-enabled collaboration solutions and reporting a 30% faster decision-making experience as a result. Patrick Kelly is the Marketing Manager for the Sheraton Athlone Hotel in Co. Westmeath, Ireland. He regularly creates content such as infographics and story maps which focus on business tourism and business communications.